The grass-roots movement to free Soviet Jews began in Cleveland. The grass roots effort that mobilized Jews throughout the nation to speak out for Soviet Jewry began in a Social Action Committee is a small Reform congregation on the west side of Cleveland: Beth Israel - The West Temple. By 1963 the group had formed the Cleveland Committee on Soviet Anti-Semitism which in October 1963 took its first nationwide step when it circulated a petition to President Kennedy. The group asked that our nation's sale of wheat to the Soviet Union include a condition that some wheat be used to allow Russian Jews to resume the baking of matzoh for Passover. The petition garnered nationwide newspaper and television coverage and emboldened the group to greater effort on a broader scale. Soon such groups began to form in many cities, with Cleveland leading the way. Rabbi Israel Porath was one of the first signers of that petition. 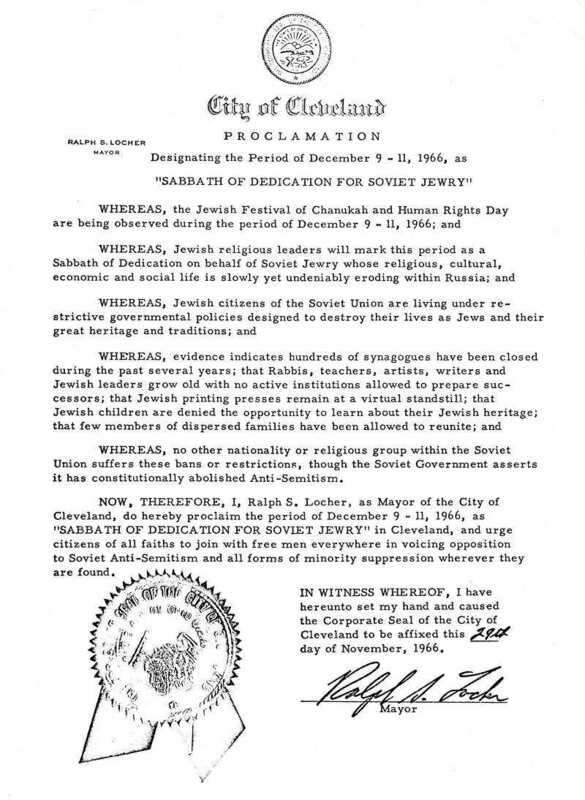 In December 1966, now known as the Council on Soviet Anti Semitism and working on some projects with Cleveland's Jewish Federation, it was arranged for the City of Cleveland to proclaim a Sabbath of Dedication for Soviet Jewry. A small group of Jewish community leaders gathered in the mayor's office for the signing. Rabbi Porath is seated in the first row, second from the left. Jewish leaders gather at City Hall to see Mayor Ralph Locher sign a proclamation designating December 9 - 11, 1966 as SABBATH OF DEDICATION FOR SOVIET JEWRY. 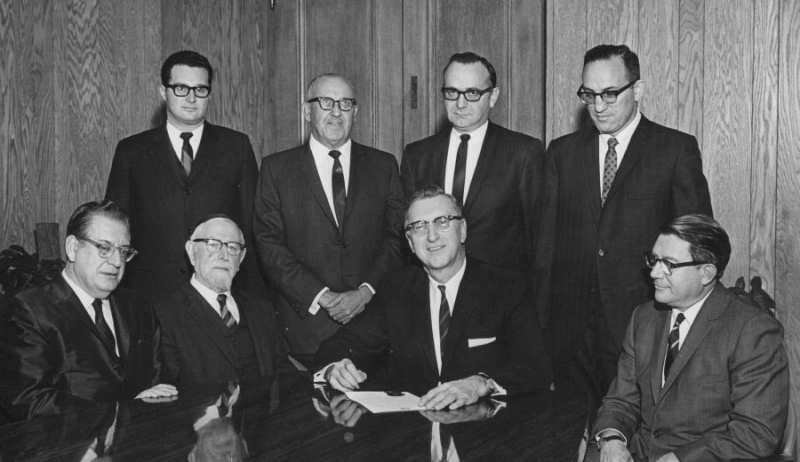 Seated (left-right) are Rabbi Rudolph Rosenthal of B'nai Jeshurun - Heights Temple (Conservative); Rabbi Israel Porath, head of the Orthodox Rabbinic Council; Ralph Locher, mayor of Cleveland, and Abe Silverstein, head of NASA and honorary leader of the Cleveland Council on Soviet Anti-Semitism. Standing (left to right) are Rabbi Daniel Litt of B'nai Israel - the West Temple (Reform); David Meyers, president of the Jewish Community Federation; Robert Silverman, chair of the subcommittee on Soviet Anti-Semitism; and Bennett Yanowitz, the chair of Federation's Community Relations Committee. This website hosts the most extensive description on the web of Cleveland's leading role in the fight to free Soviet Jewry. For Dr. Louis Rosenblum's pages, click here.